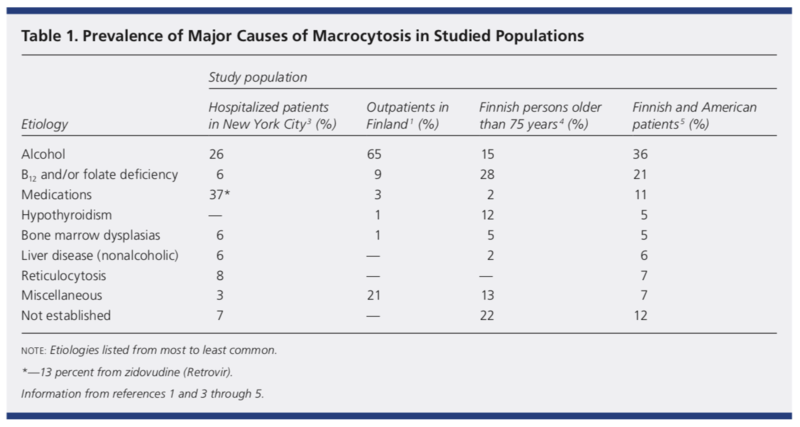 Macrocytosis is identified when on blood levels the mean corpuscular volume is over 100 fL. It has been seen that around 3 percent of the United States population is affected by macrocytic anemia. The underlying etiology of macrocytic anemia can be multifold. It often will vary based on the age of a patient as well. Hypothyroidism has been found to be the most common cause in the elderly population than in other age ranges. Some other common etiologies include vitamin B12 deficiency, folate deficiency, and Helicobacter pylori infection. Once macrocytic anemia is found on blood work, history and physical examination can help elucidate a potential cause. Regarding the workup of macrocytic anemia on complete blood count, one should begin with ordering a vitamin B12, folate, reticulocyte count, and peripheral blood smear. The reticulocyte count will help to assess if the bone marrow is responding to the anemia appropriately. If the reticulocyte count is elevated, the most likely etiology is hemolysis or blood loss. Additionally, the body naturally recovering from the anemia with increased productions of red blood cells will cause the reticulocyte count to be elevated. Ordering a vitamin B12 and folate are essential often is diagnosing macrocytic anemia. Consideration of possible spurious macrocytosis should be given as well.This can be caused by leukocytosis, cold agglutinins, or hyperglycemia. Cold agglutinins cause red blood cells to clump together, which makes them appear larger in size on the automated counter. Hyperglycemia causes a patient’s blood to be more concentrated; then when it is diluted for testing and measurement of the mean corpuscular volume, the cells will tend to swell causing a false elevation. Lastly, the increased haziness of blood with elevated white blood cells can cause the automated machine to give a false elevation of the cell size. If the initial workup with the vitamin B12, folate, reticulocyte count, and peripheral blood smear have not pointed you towards a diagnosis for the macrocytic anemia, consider completing a comprehensive metabolic panel looking specifically at the liver and kidney function. In addition, looking at the thyroid stimulating hormone for thyroid conditions, and methylmalonic and homocysteine levels to assess for vitamin B12 deficiency, even with a normal vitamin B12 level. If the underlying etiology is still unknown, look at the patient overall and their clinical picture and determine if a hematology consult would be needed for consideration of a bone marrow biopsy. 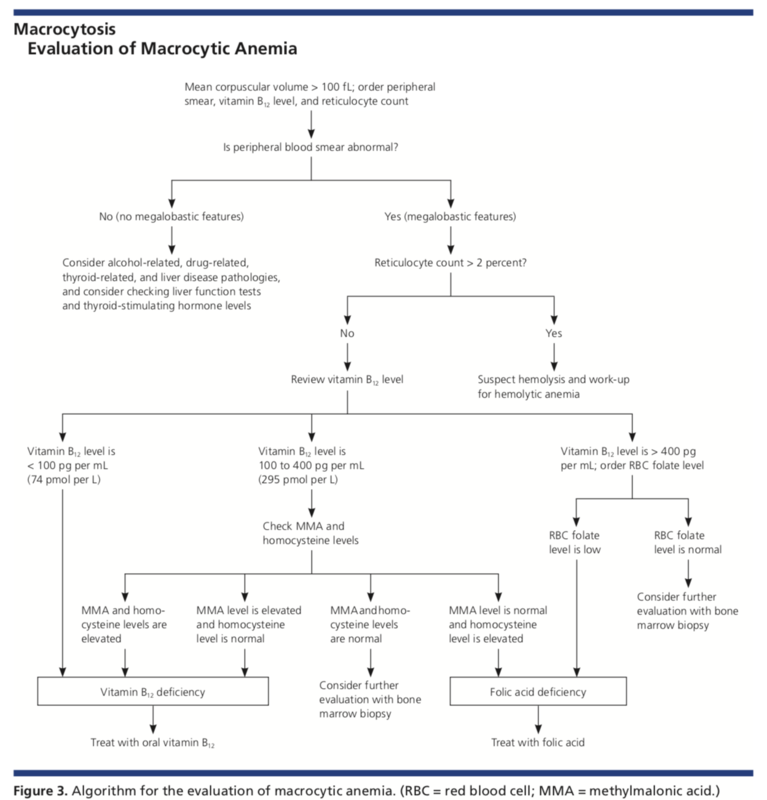 Now that we have discussed the overview of how to work up macrocytic anemia, we will next dive into the specific etiologies. Vitamin B12 deficiency is a commonly learned etiology for macrocytic anemia.Vitamin B12 is absorbed in the terminal ileum of the small intestine when it is attached to intrinsic factor. In pernicious anemia, the cause is not the lack of vitamin B12, but the lack of intrinsic factor not allowing the vitamin B12 to be adequately absorbed. Pernicious anemia is most often caused by autoimmune gastritis, in which autoantibodies attack the body’s own gastric parietal cells and intrinsic factor. A couple of other less likely etiologies for pernicious anemia include nonautoimmune gastritis caused by Zollinger-Ellison syndrome or Helicobacter pylori infection. Patients who have vitamin B12 deficiency may have complaints of peripheral neuropathy symptoms, paresthesias, poor diet or strict vegan diets, chronic diarrhea, or a history of bowel surgery, including weight loss surgeries. On physical examination, patients may have ataxia, decreased vibratory sensation, and proprioception. Additional findings may include poor dentition or stomatitis/glossitis. Some other rare causes of vitamin B12 deficiency includes nitrous oxide abuse, due to the chemicals ability to inactivate vitamin B12 through oxidation. Lastly, Diphyllobothrium latum, a fish tapeworm, infection or inherited causes of vitamin B12 metabolism such as Imerslund syndrome are more rare causes. Regarding the laboratory diagnosis of vitamin B12 deficiency, only around 10 percent of patients will have anemia seen on complete blood count. Therefore, if your clinical suspicion of vitamin B12 deficiency is high, don’t stop at a normal vitamin B12 level and think, “well I must have been wrong” if it is normal. If a vitamin B12 level is normal, which ranges from 100 to 400 pg/mL, but your suspicion is high, a methylmalonic acid and homocysteine levels should be completed and if elevated may point you towards a diagnosis of vitamin B12 deficiency. The Shilling test is not widely used any longer, but in the past, it was useful to help determine if a patient’s vitamin B12 deficiency was due to pernicious anemia, malabsorption, or dietary deficiency. Regarding therapy for vitamin B12 deficiency, oral therapy has been shown to be as effective as intramuscular injections. If intramuscular treatment is selected, 1000 mcg should be given once per week until the deficiency is corrected and then once per month. Oral dosing for replacement is 2000 mcg daily for one to two weeks, followed by 1000 mcg daily. Some sources recommend continuing the maintenance dosing for life. It is important for patients to continue long-term therapy because often the deficiency will recur if treatment is stopped, unless a reversible etiology is found. Medications can often be a cause of folate deficiency, especially medications for seizures, cancer, and autoimmune diseases.Some medications include methotrexate, phenytoin, cholestyramine, pentamidine, Bactrim, pyrimethamine, metformin, and 5-fluorouracil.In addition, metformin can cause vitamin B12 deficiency as well. When looking for folate deficiency, the measurement of serum folate is not the most useful due to the level fluctuating often and quickly due to dietary intake. Instead, RBC folate levels are more accurate in regards to folate stores.Other lab results that may be found in a patient with folate deficiency include a normal methylmalonic acid and elevated homocysteine level. 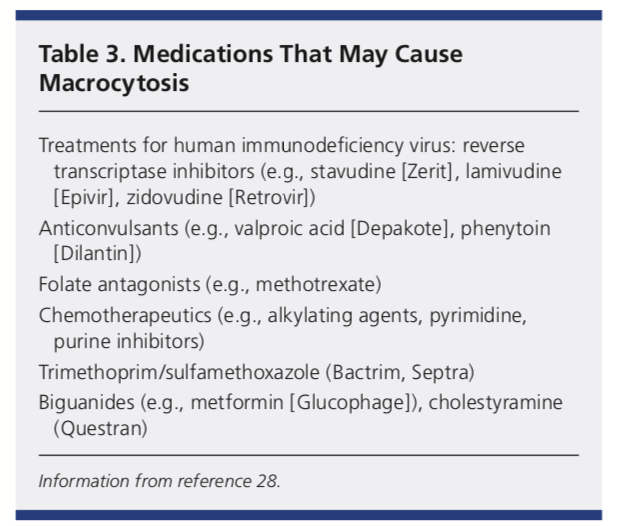 Treatment of HIV with reverse transcriptase inhibitors, such as stavudine, lamivudine, or zidovudine can cause macrocytic anemia due to their mechanism of action of interfering with DNA production.However, often these patients will have macrocytosis without anemia present.In these cases, it tells healthcare providers that the patient is compliant with their HIV therapy, and no treatment is necessary for the macrocytosis. 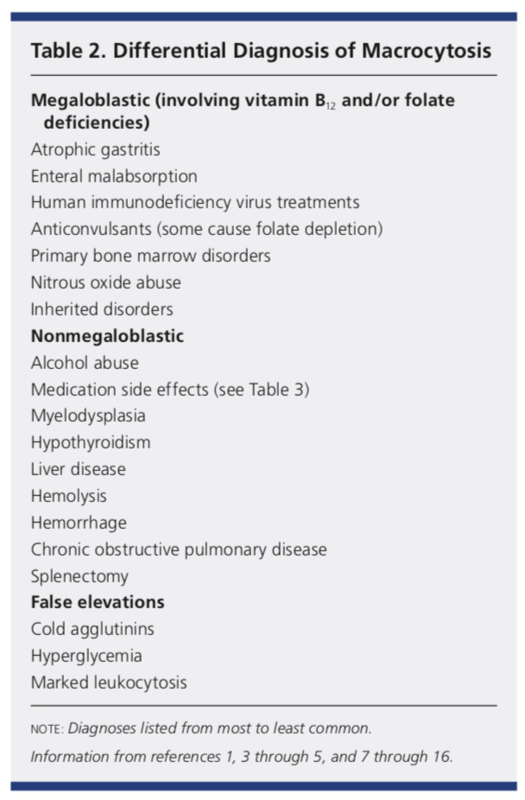 Some final etiologies that may lead to macrocytic anemia include sickle cell disease, G6PD deficiency, hereditary spherocytosis, alcohol abuse, bone marrow dysfunction, hypothyroidism, liver disease, renal disease, splenectomy, down syndrome, nonalcoholic fatty liver disease, and chronic obstructive pulmonary disease. UpToDate. Macrocytosis/Macrocytic Anemia. Accessed: May 7, 2018. UpToDate. Treatment of Vitamin B12 and Folate Deficiencies. Accessed: May 7, 2018. Family Practice Notebook. Vitamin B12 Deficiency. Accessed: May 7, 2018.